Ground floor: Entrance hall. Cloakroom. L-shaped sitting room (TV, DVD, CD, WiFi). Dining room (fireplace). Kitchen (oven, microwave, dishwasher, washing machine). Store room (feature olive oil well).First floor: Wide curving marble staircase leading to spacious landing with original patterned tiles. Double bedroom with en suite bathroom. Twin bedroom with en suite bathroom. Four twin bedrooms. Two bathrooms. All bedrooms are equipped with air conditioning.Outside: Barbecue. Table tennis. Spectacular views from poolside terrace and gardens. Lovely walks around the open farmland of the estate. Parking.Private swimming pool (10m x 5m) surrounded by lawns. 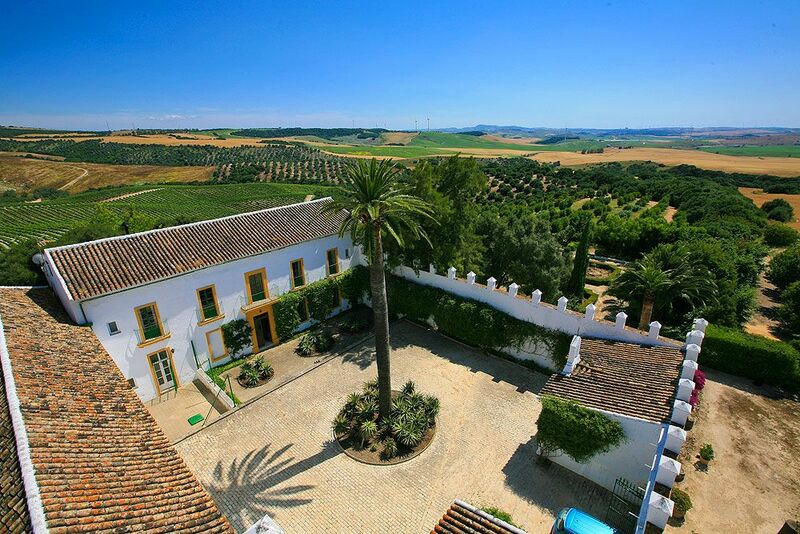 Originally built in 1881 this unique and imposing property lies in the heart of the countryside near Arcos de la Frontera and has been in the family of one of the world&#39;s most famous and respected sherry producing dynasties for over two generations. Sedately positioned at the end of a long, private country track in an estate of some 900 acres, La Parrilla commands impressive rural views. In the distance stands the former Moorish castle of Gigonza whilst a grove of 400 almond trees starts next to the swimming pool. Whichever direction you choose to explore you will never be far from the vineyards themselves - still an integral feature of the &#39;hacienda&#39;. While remaining very much part of a working country estate with the normal comings and goings of country life, this will have no effect on your own privacy which is assured from the moment you enter the impressive front courtyard. A small family chapel lies adjacent to the arched entrance. The owners have thoughtfully and tastefully refurbished the entire property to a high standard. Internally, rooms are generously proportioned and care has been taken to retain the character of a bygone era. Externally there is a shaded, lawned area to the rear with steps at the side leading down to the private swimming pool where the terrace alongside makes a splendid spot in which to enjoy a barbecue. At La Parrilla you are ideally placed to explore this wonderful region - indeed you are spoilt for choice. A 15 minute drive takes you to the town of Paterna de Rivera which has all amenities including three local &#39;ventas&#39; (country restaurants) and a pizzeria. The spectacular hilltop town of Arcos de La Frontera is within 25km, Medina Sidonia (21km), Jerez (36km) while Cádiz and the unspoilt Costa de la Luz are around a one hour drive. The natural park of Grazalema, home to some breathtaking scenery, is an hour away while the stunning city of Sevilla and rich history of Ronda can also be sampled as excellent day trips. Included in the price is a housekeeping service from Monday to Friday (daily cleaning and cooking if required). This is a beautiful 6 bedroom property located in Andalusia, Spain. This villa, in San José del Valle, is a comfortable property sleeping 12 people. The villa offers superb accommodation, including modern luxuries such as a television, table tennis, swimming pool, DVD player, air conditioning and internet access.